Warning! These schedules are not recommended, and should not be treated as suggestions. The only reason these unadvisable schedules are handpicked from a surplus of bad schedules is because these have been honestly attempted and failed, and because they go directly against recommendations made on this guide, thus providing a great opportunity to showcase a visualization of which fundamental rules have been ignored when the schedule was designed. Again, you are advised not to attempt any of the schedules talked about in this part, as they will most likely lead to failure! The following bad schedules have been picked to show which integral parts of scheduling have been ignored. This also provides you the opportuníty to catch information that you might otherwise have missed or misunderstood, so make sure to review the reasons given why these schedules were failed to be adapted to. It should be noted that some variations of these schedules might have actually been adapted to by some people, but the difficulty would clearly be a lot higher than with the standard versions, and there is no telling that you would actually succeed in the adaptation were you to attempt it. The basis of Zoidberg revolves around the idea that you can interchangeably nap for 20 minutes, stay awake for 20 minutes, then rinse and repeat, stacking these sections on next to each other, resulting in so called “z-cores”. It is a nap-only schedule like SPAMAYL, but instead of naps as-needed spaced throughout the day, they are all adjacent at night. Zoidberg allows for adding another nap if needed to the z-core(s), or during the day as need be. It attempts to capitalize on the high sleep quality from sleep onset REM or SWS that is known to occur with well-spaced naps by repeatedly triggering the sleep-onset REM and SWS, resulting in large totals of restorative sleep. However, this is completely the opposite of what happens, and adaptation fails for multiple reasons. Two people who attempted the schedule for a few months never got close to adapting, even though they temporarily thought it was working. During adaptation stage 1, waking up, and going to sleep is problem free. Falling asleep for the later naps becomes hard, because of the wakefulness sustaining from the earlier naps, despite the fact that the naps consist mostly of light sleep due to the brain considering the whole z-core to be one interrupted sleep block. This leads to failure to trigger sleep onset REM or SWS during the interrupted points, or for a majority of the naps. Every interruption in sleep also requires an additional amount of light sleep to serve as a transitional phase from waking back into sleep, further reducing time available for SWS or REM. 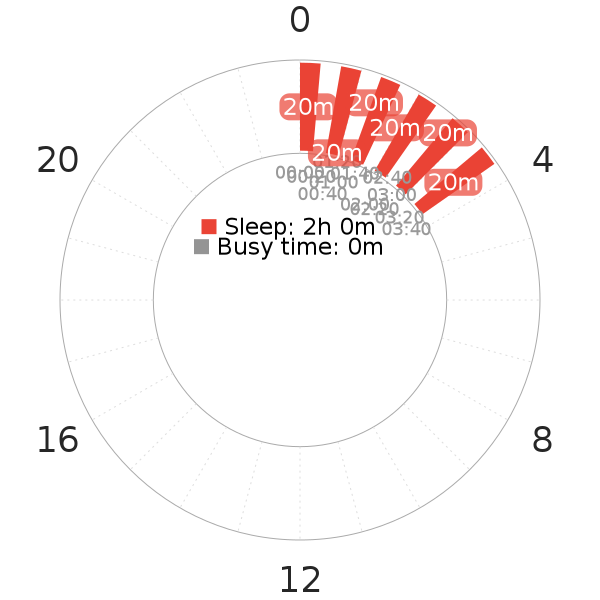 Zoidberg can therefore be compared to sleeping a single, interrupted cycle a day. 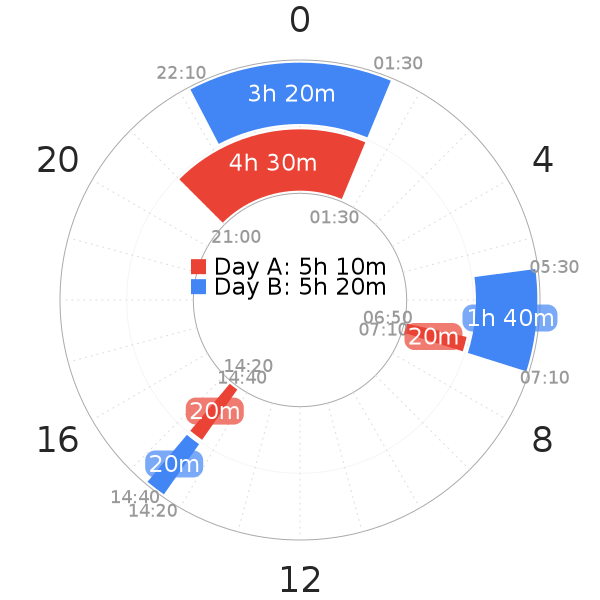 The percentage of light sleep is extremely high in this demonstration of what effect the zoidberg schedule has on sleep, as shown in the picture below, which displays two days of forcefully interrupting a core. Scheduling sleep blocks too close together will lead to exactly the same thing happening on other schedules. The schedule is not even viable short term, as the humongous sleep pressure originating from only being able to achieve light sleep eventually causes people to oversleep. 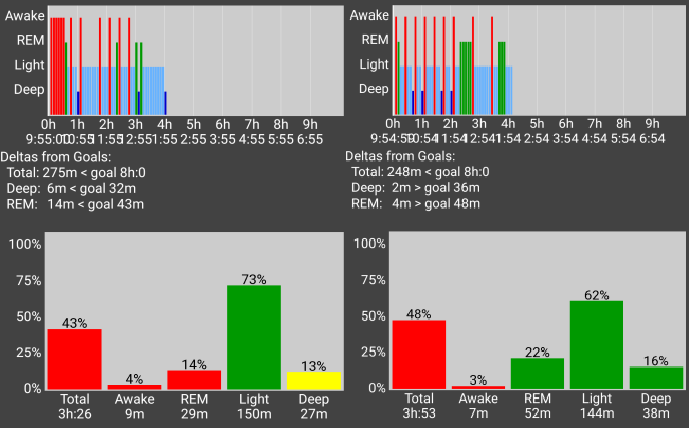 Short-term attempts only result in forcing light sleep into the cycles, replacing major parts of the SWS and REM chunks. This left one of the experimenters with impaired sleep after the adaptation attempt, as they kept waking up every 20 minutes for a very long time after returning to monophasic sleep. This habit takes time to fix, and it ruins any chance at adapting to other schedules with cores in the meantime. Both of the attempters were fine until adaptation stage 1 was over, and were then left with built up sleep debt, causing them to wake up from SWS or REM very often and leading them to feel incredibly awful and irritated. It’s been demonstrated that no matter how much strategy or willpower you have, your sleep debt will get to you and you will not be able to power through. Waking up every 20 minutes won’t lead to restful sleep nor will it provide the amount of SWS and REM you need. This alternating schedule was attempted in order to determine whether 48 hour long circadian rhythm schedules would be adaptable. There had been several people attempting schedules similar to this one where they sleep one pattern during the week, and another during the weekend, with poor results. Therefore the conclusions made in this text are applicable to such schedules as well. The schedule above, shortened as ADE for brevity, was constructed with the intention to vary as few variables as possible. Each sleep is woken up from at the same time every day, and the total sleep time is kept very similar. A dark period is also kept at the same time every day. Because of this the only changing factor is going to be the length of the individual sleep blocks. During the early parts of adaptation stage 1, waking up was easy, however, fatigue started building up very soon. The issues became immense at the start of adaptation stage 2. The tiredness from when the previous days sleep blocks were had was extreme. Intense symptoms of sleep deprivation were experienced, like fatigue, forgetfulness, minimal ability to focus, a general feeling of disorientation and such. The days also blended together, and the sense of time was completely lost. Conclusively it can be said that varying the length of sleep blocks will lead to similar things happening on other schedules, and will therefore most likely lead to a very tough battle against extreme sleep deprivation symptoms and to an inability to successfully adapt.